-Exercise to boost energy and this makes everyone happier. -Take action, do not put anything off, do it now. -Plan then make a decision and do it, good enough is good enough. -Be in control, it is a basic psychological need to feel secure, and good at what we do. -Choose to have fun, eliminate sources of irritation and be happy! www.pamprentice20…-Read my fun blog for tips. Sir Russell Coutts, Wellington New Zealand won four America’s Cups (1995, 2000, 2003, 2010). Matthew Mason first won the America’s Cup with Team New Zealand in 1995 and was with the team for its successful defense in 2000. In 1992 he won the ISAF Match Racing World Championship with team CEO Russell Coutts. Truth is Beauty is the second sculpture in the series, The Bliss Project, three monumental sculptures of a woman, Deja Solis, expressing her humanity. Truth is Beauty is about 55′ tall, constructed of welded steel rods and balls, covered in stainless steel mesh skin with interactive lighting effects. These sculptures are intended to demand a change in perspective, to be a catalyst for social change; to de-objectify women and inspire men and women to take action to end violence against women, thus allowing both women and men to live fully and thrive. Truth is Beauty was installed at Burning Man 2013. She was lit with over 3,000 pixels individually addressable and enhanced with 3D printed light shades. The installation of “Bliss Dance,” a sculpture created by artist Marco Cochrane, is part of the Treasure Island Development Authority’s public art policy. I watched the artist create and weld his magical 40-foot dancing woman in his studio. The sculpture was part of the 2010 Burning Man festival and now she is displayed on Treasure Island in San Francisco. Marco Cochrane was born in Italy, raised in Northern California, and currently works out of his studio on Treasure Island. Bliss Dance was described by city officials as a marriage of classical sculpture technique and modern design. The sculpture is lit by 1,000 LED lights controlled by a customized iPad application. A Weekend Sail to Half Moon Bay! Our overnight cruise to Half Moon Bay with the Islander 36 Association. 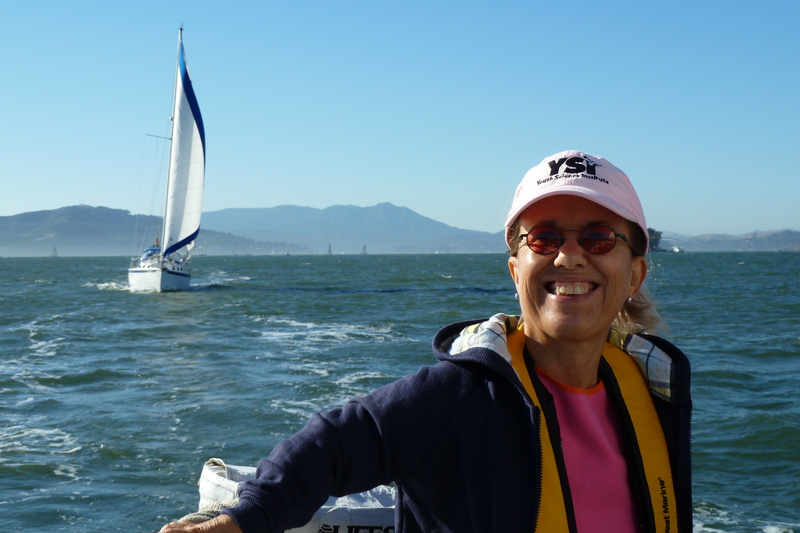 Having fun on the Orion, sailing, racing, cruising down the coast and around San Francisco Bay!